The location was at Hump Back bridge on the George Washington Memorial Parkway in Virginia. The "Take It!" was ever so easy. Here was a brand new tunnel less than a year old. Heck the stripes on the pavement are barely dry. 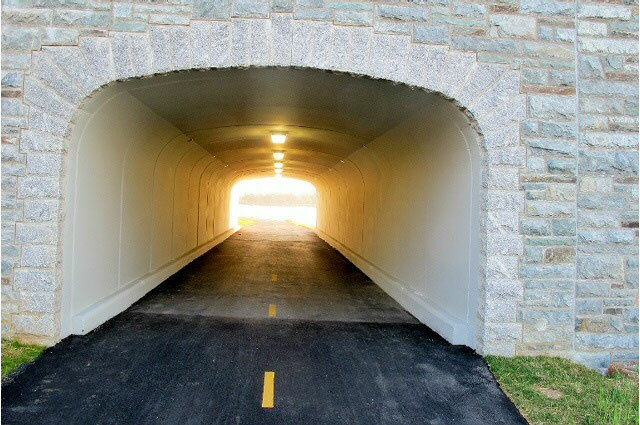 This was a project that took several years as it is an underpass and only the pedestrian and bicycle path under the road. Immediately next to this path is a separate tunnel to accommodate the boats in a yacht harbor some of which are rather large, so it is a big tunnel. The After Take: I have shown this picture to a number of people to get their feedback. Without exception they all liked it. There is just something we all seem to know and desire about a tunnel, that being that there is light at the end of it. This photo has that light and it is clear and bright. Lots of non stated hope can be felt in this lucky to have gotten picture. I think it has a very inviting look about it, a beckoning of sorts, inviting the viewer to come on through and enjoy what is waiting on the other end. Here is hoping there is light at the end of any tunnel you may encounter and the vision is bright and in your favor. Thanks for joining us for the current photo presentation. You are cordially invited to return Friday, May 11th for a new picture that we hope you will enjoy. Something about this one, i really like it.